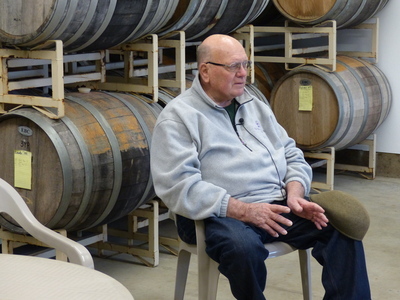 Carl Dauenhauer is photographed during an oral history interview at Hauer of the Dauen Winery in Dayton, Oregon on February 4, 2016. Dauenhauer was interviewed by Linfield College archivist Rachael Cristine Woody. Also in attendance were Linfield College Archives staff Rich Schmidt and students Shelby Cook and Andrea Pakula. Carl Dauenhauer and his wife Lores are co-owners of Hauer of the Dauen Winery in Dayton, Oregon, founded in 1999. The Dauenhauers grow grapes to sell to wineries in the region, in addition to growing grapes for their own estate label wines. Linfield College Archives, "Carl Dauenhauer Interview 04" (2016). Browse All Willamette Valley Oral History Interview Photos. Image. Submission 218.